BMW 320d tuning and BMW 320d ECU remapping. Viezu are delkighted to bring you our r BMW 320d tuning and BMW 320d ECU Remapping services. As weall know BMW manufactures lovely motorcars and such a prestigious brand really does deserves the best in engine tuning and remapping, this is where we really believe we can help, we have much to offer, and its all custom and unique, our BMW 320d tuning software is written in-house live by our dedicated team of ecu remap software specialists. 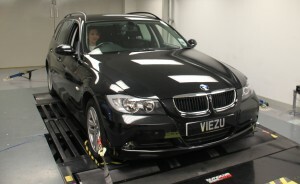 Watch Viezu performing a BMW 320d dyno run here: https://www.youtube.com/watch?v=7HCArAvnkKU Viezu BMW 320d tuning can be custom tailored to ensure we meet your requirements and needs, including performance and economy tuning, if you’re after an increase in throttle response and performance from your BMW 320d tuning, our prestigious BMW 320d performance tuning will seriously improve the drivability of your BMW 320d. Or if you have fuel economy in mind, then Viezu’s BlueOptimize BMW 320d economy tuning is for you.